A radio announcement… an excited phone call… and our sly gumshoe, Skye Watcher, is on the case. Explore with Skye and discover what happened to the ex-planet Pluto as she tracks down clues that st retch back hundreds of years! Audiences will have great fun with this unique program that looks into the changing status of planets in our Solar System. 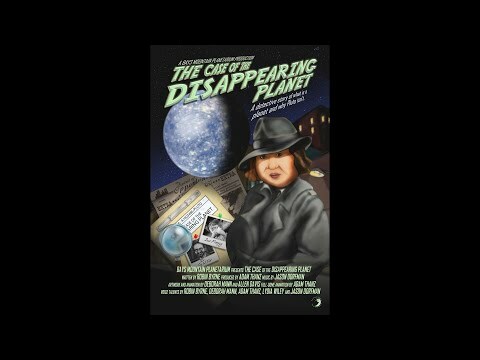 The full-dome version of “The Case of the Disappearing Planet” features expanded and immersive visuals and an updated soundtrack. Follow the sly gumshoe, Skye Watcher, as she discovers what is a planet and what happened to Pluto. In her que st, she finds out that this has already happened 200 years ago with the discovery of the asteroids! Our super-sleuth discovers that science rules throughout this planet-status journey with the correct application of the scientific method. This show is great for school children of 3rd grade and above as well as the general public.